The desert has us now…. As everyone around will know I seem unable to talk about anything except the desert at the moment. Luckily a lot of this talk happens on training runs with my MDS buddies. This blog consists of a couple of emails which I received from John (JB) yesterday and today. They are a great example of what the race is doing to us! So reproduced with JB’s permission….. The wife was away and so it was time to play sleeping in the desert last night!! The forecast was 3-4°c overnight with a good breeze in the air and so I set up camp early in the evening choosing a generous area of sandy coloured carpet, I turned off the radiator and opened all the windows to let the room cool and then I chilled downstairs next to the wood burner until bed time. I’d debated (with myself of course as even the dogs are fed up of MdS talk) about wether to use my sleeping mat, as the inch of thick twill 80/20 and underlay would be better than I’d expect in the Sahara, but decided I’d try it anyway. At bedtime the old thermometer I’d found told me it was 10°c, a lot warmer than it felt and I hoped that time had made it inaccurate. I wiggled my way into my zip less, borrowed “it’ll suit ya down t’ground that lad. It weren’t cheap and its proper down ya know” sleeping bag and drew the hood tight at about 11pm. My head was resting on my full pack all was lovely. Comfy and cosy until at least 11:02!! I sleep on my side and was feeling ever rib I have, but hey I’m a roughy, toughy desert runner so I doubled over the long mat (which I’d intended to cut down before the race) and drifted off to sleep for couple of hours. My minuscule bladder, back ache, stiff neck and sore ear woke me at about 1:30. The room felt freezing on my trip to the loo (no I didn’t go into the garden as I didn’t want to wake the dogs) but the ageing thermometer hadn’t budged. I squirmed my way back into the bag almost twisting a knee (bags, tight spaces and tired legs are going to require care and practice) but couldn’t settle. The pack/pillow was just too uncomfortable. So I stuffed t-shirt in the sleeping bag stuff sack and surprisingly that was enough to solve the issue. Having doubled up the sleeping mat earlier I now folded it to 3 layers. It was finally sufficient padding but now too short!! As I fought my way back to sleep I wondered if I was getting cooler and the next bladder alarm at 3:30 told me I was. The thermometer stubbornly insisted it was still 10°c as I squirmed back in to the chilled bag. I needed more warmth but surely not. I was inside at 10°c ‘apparently’. In the race I could use my race/camp kit I suppose and use the tiny pertext wind top I’m taking but I didn’t have this to hand. Resisting the king size bed I reached out to find the Yorkshire flag that might find its way to the finish line depending on my final pack weight and hey presto, a sheet. I stuffed it into the bag on top of me and it did the trick. I slept again until 5:30 when I didn’t give in…… “NEVER EVER GIVE IN” …. but I concluded that there was nothing more to be gained from my experiment. Having learned valuable lessons I climbed into the marshmallow giving the pillows an extra plump and doubled over the 13.5tog quilt and fleecy blanket on top of me. Bliss! My sleeping bag might not be adequate alone. I need buy a liner as I will have limited kit to layer up. I need to stop being tight and buy a proper sleeping mat and give the wife her exercise mat back!! Sleep=recovery!! I can tolerate using my pack as a pillow but need to take time to get things right. Be honest about what you can live without. Test out ALL your kit even if it means looking a twit you need to learn lessons now not when it’s too late. (2) I ought to try out my sleeping bag, liner and mat on the stone floor at home and not on the sofa as I did a couple of weeks ago! (3) The desert has taken JB too…. The last couple of weeks have brought some variation to my training. 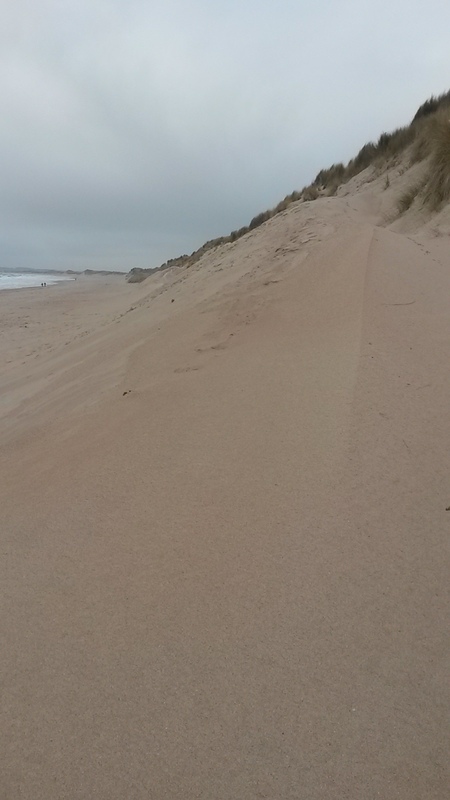 In addition to my usual off road moor runs I have enjoyed some long road runs home from work, a beach and dune run and running with a much heavier pack – although I didn’t enjoy the latter much and cycling. So road running is not really my thing but after struggling to motivate myself out into the freezing cold after returning to a warm home following a long day at work I decided it best to cut out that step! The next day I changed straight into my running gear, filled my pack with all my work gear and set off running home. As many people have pointed out to me (and I already realised!) work to home is all up hill. I chose a ‘scenic’ even hillier route and feeling like forrest gump off I trotted home. Nearly 13 miles. Lots of busy road crossings. 2.5 hours. Training done for the day. The following week I did it twice. This week will bring it again. What took me slightly by surprise on these runs has been my ability to zone out and take my mind elsewhere – a skill which I’m sure will serve me well in the desert! With most of my running being shared with the company of great friends or being off road and concentrating on the next step I haven’t experienced this complete zone out for a while. Woah – sand dunes make your legs burn! Especially with 6kg in your back pack – but this is nothing compared to miles of dunes with up to 10kg on your back which I will be experiencing soon. All said though I loved my day at the beach (Druridge bay) made even better by the company of my two oldest and bestest friends, one with her beautiful newborn son. Part of my beach running involved dune reps back to my friends who soon sent me on the next rep!! Lovely food and a good catch up followed. Fantastic day. I learnt some valuable lessons about how to ascend and descend dunes, how it feels to have sand in your shoes and a but about how sand moves. All this sounds really obvious but you think about things in a different light when you are heading to the Sahara for a week. It has helped me decide on sock choice (injinji toes socks with my usual running socks on top), shoe size (with the double socks and knowing my feet swell I am going for a UK size bigger for my race shoe) and also encouraged me to add some steep hill reps in the coming weeks training. I have become perfectly happy with 5kg in my pack for long hilly runs. An increase to 7.5kg was a shock (especially as I thought I only had 6kg until l got home and weighed it properly!). At no point was I going to abort my 15 mile run but I was much slower than usual and forced to walk most of the climbs. I am confident that I will soon become accustomed to the heavier weight as I did with 5kg. 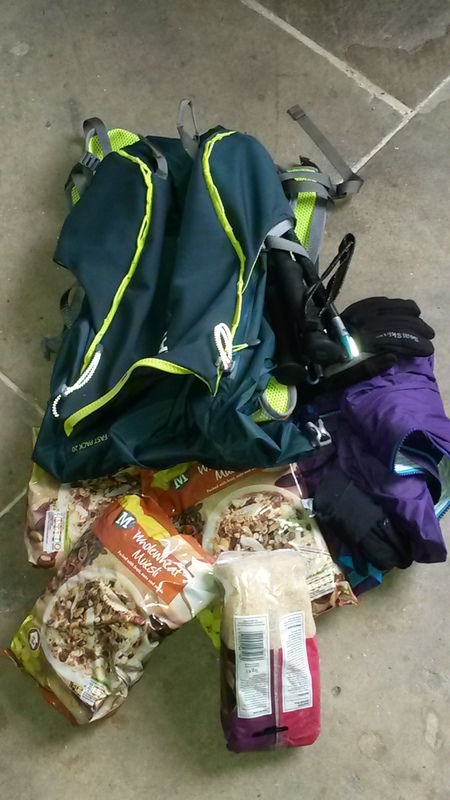 I also find it mildly entertaining to fill my pack with bags of muesli and rice to get the weight up. In an attempt to get the best calories per gram for food I actually like I have a spreadsheet to add the information to. This also includes macronutrient content so that I can try and have enough carbohydrate during the day and fill up on protein and fat at night. Dehydrated foods seem the best option. John, Simon and I got together and had an MDS picnic (whilst watching Genis’ webinar) to try a few. We tried four. For me – two were ok, even pretty nice – one was unpleasant but edible and the fourth just revolting!! I love my food and will eat most things but am at my fussiest when I am tired. So it is going to be really important for me psychologically to know that I’m going to eat food I like at the end of each day in the desert. While it is expensive to keep trying these dehydrated foods I need to find another that I like. I have sorted my snacks though. 9bar! I love them! The peanut ones are 290kcal for 50g weight and they taste like food not just energy goo. I am also taking some pumpkin bars (250kcal/50g) and the breakfast bars. Twiglets, jelly beans, granola, allsports desert survival formula and pot noodle will constitute the rest of my food in the desert. Riding my bike has been on the back burner with run training taking priority. The last few weeks have been me on my bike more often, mostly for active travel. I have really enjoyed it. It is in addition to my runs but I feel like it has taken pressure off running somehow. Scorpions, being hungry, being stuck on a treadmill going nowhere….are featuring in my dreams during the last week! I can tell the event is getting closer….. The 2015 route will not be the same but the format will likely be similar. Now you can all share the miles with me! My race number is 0414. Once the race starts you will be able to track me online (I will send all the details round again before I leave). A couple of people have said that they would like to sponsor me by the mile for the Intensive Care Foundation. Just Giving cannot process this on their site – they can only take payment at the time of the sponsorship pledge. If anyone would like to pledge per mile, you could comment on this blog post and then donate via http://www.justgiving.com/michellemorris-mds when I complete the event. This way you can experience every mile with me from your pockets! Please pledge your donation in the ‘Leave your reply’ box below. Last weekend James (my boyfriend) and I treated ourselves to a weekend at the lovely Harewell Cottage (www.harewellcottage.co.uk) in Glasshouses. Only 40 minutes from home, but a new set of training routes on the doorstep. Once the training is done, there were no distractions aside from the log fire and complementary vino. Perfect blend of training and rest. On Saturday we enjoyed an 11 mile hilly loop, walking together, with my backpack loaded (I have an Ultimate Direction Fastpack 20 from my race kit – so far it is great. The service from ‘My Race Kit’ was excellent – but more about that in the kit blog which I will write soon. There was plenty of snow on the ground but the really challenging bit was the frozen ice – and there was lots of that too. Despite James’ best Bambi on ice impressions it was me that ended up on my derrière! Ouch. It didn’t dampen the mood though and we treated ourselves to a lovely cafe lunch in Pateley bridge on the way back. Sunday was real treat for me – a cycle ride. Something which I haven’t done for weeks – well maybe months! There is a reason why the area is called Nidderdale ANOB (Area of Outstanding Natural Beauty). A beautiful 30 odd mile loop past Brimham rocks, into Masham and back over Lofthouse Moor – what more could you want. What about 30-40 mph wind? Yes – we got that too. Full on head wind over the moor. I saw the speed on my garmin drop as low as 2.5 mph. I felt like I had done battle with a wild animal the next day – I had needed to rag the handlebars that much to get up the climb into the wind. James waited gingerly at the top, nervous of a potential of a tantrum but he was greeted with ear to ear smiles. It was so much fun – ridiculously tough – but just ace! I enjoyed a nice 10 mile run on Monday morning – such a treat when I’m usually at work. A sports massage in the afternoon topped the weekend off well. All this followed a different kind of weekend where I had a brief foray with road running. I raced the Brass Monkey half marathon at York. 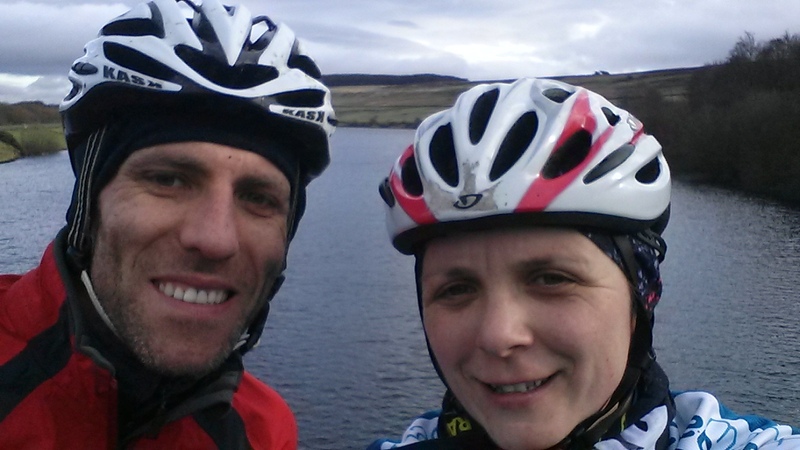 The race conditions lived up to the name – it was freezing! With the exception of large sections of black ice en route it was near perfect running conditions. Despite all my long slow training miles I surprised myself to carry off 8 minute (well 8:04) miles to run a pb of 1:46:28. I also surprised myself to quite enjoy it. When I completed the same race in 2012 I said ‘never again’. I found the fast, flat smooth roads incredibly boring. I missed the hills, the mud, the bogs, gates and styles, but this time it was all a mind game. There will be flat endless sections in the desert where it will be mind over matter to keep going. So Brass Monkey was a test of the mind. I couldn’t let it beat me and it didn’t. I might even go back next year – the marshals all around the course were second to none and really made it a fantastic race. Getting to catch up with a very old friend at the finish made it a fab day out. Today the mind games continued as again my training ventured away from the usual routine. I caught the train with Fe and Simon (MDS training buddies) to Skipton to walk/run back along the canal. When we live in such a beautiful area with open moorland, fantastic trails and woodland I rarely bother with the canal bank. I didn’t ask any questions about the walk/run routine. I assumed it would just be mostly running with a bit of walking to break it up. My pack today weighed in just short of 5kg again (3 bags of porridge oats today’s weight of choice). Only when we set off did I realise the session was much more formal – Simon set his watch to beep every 2 minutes. 2 minute run, 2 minute walk, 2 minute run, 2 minute walk…..It was fun with good company. We nearly had the extra laugh of Simon slipping into the canal, but he corrected himself just in time. After 2 hours of 2 minutes run, 2 minutes walk I chose to keep running. I needed to be back in time for lunch and I was pleased with myself for sticking it out for 2 hours. Simon, having done MDS before, assures me this will serve me in good stead for the desert. I am happy with another 19 miles in the bank today.